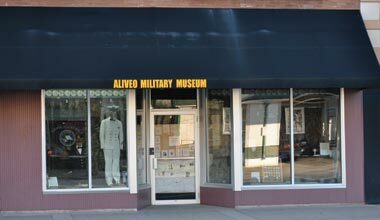 The Aliveo Military Museum is part of the Aliveo Learning Center Inc. Our purpose is to operate and maintain this museum that will preserve and honor those that have served their country. Our mission is to educate the public, especially the youth, about military history through the protection, preservation, and presentation of military artifacts. It is an important tool to teach our nation's military history to school-aged children and the public at large. For as long as human history has existed, an essential part of society has been the recording of its past experiences. Military history is a component of that need, to record the passage of time and the role that the military has played in the story of our country. The Aliveo Military Museum has a significant collection of military artifacts such as military pistols, rifles, edged weapons, uniforms, insignia, badges, flags, and equipment. The collection includes relics and artifacts from the Revolutionary War, Civil War, WWI, WWII, Korea, Vietnam, and the Cold War to the current Middle-East Wars. We even have a section on the Zulu/ British War. We hope you will find the items on display interesting and educational. We encourage educators and students to visit the museum.